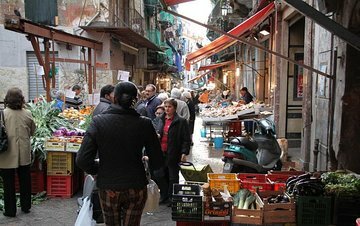 Con un tour a piedi di 3 ore a Palermo, esplora le piazze, i monumenti e i mercati del centro città con una guida informativa mentre ti fermi per assaggiare il cibo di strada. Immergiti nella cultura locale e impara qualcosa sulla storia di Palermo mentre ti godi dei campioni e incontri i fornitori di cibo di strada. We booked this tour after reading some reviews - and we were not disappointed! There were 7 in our group and our guide, Fulvio, was absolutely charming. We went through markets and he pointed out historical places throughout- we even had the chance to go into some of the churches. Fulvio was so laidback and easy - he wanted to make sure we all had a great experience- and he added wine to enhance the tour! Would highly suggest this tour and especially our guide, Fulvio di Cicero! We had a great time, my husband and I and another couple. We are vegetarian but still had masses to eat, we had a lot of fun and got a lot of info both on the food and on the City. We usually do a food tour whatever city we are in as it explains the food and gives a good insight into the city. Great opportunity to experience authentic Palermo Street Food! Tried many different kinds of street food and food I would never think to try myself! Enjoyed seeing the Palermo Street Market and watching the locals in their every day routines. This tour was fantastic. Our tour guide, Georgio, gave us a great guide with the history, culture and life of Palermo. We were part of a small group, only one other couple, which was very personal and made for a great time. Georgio was was such a good sport sharing his love of the street food.